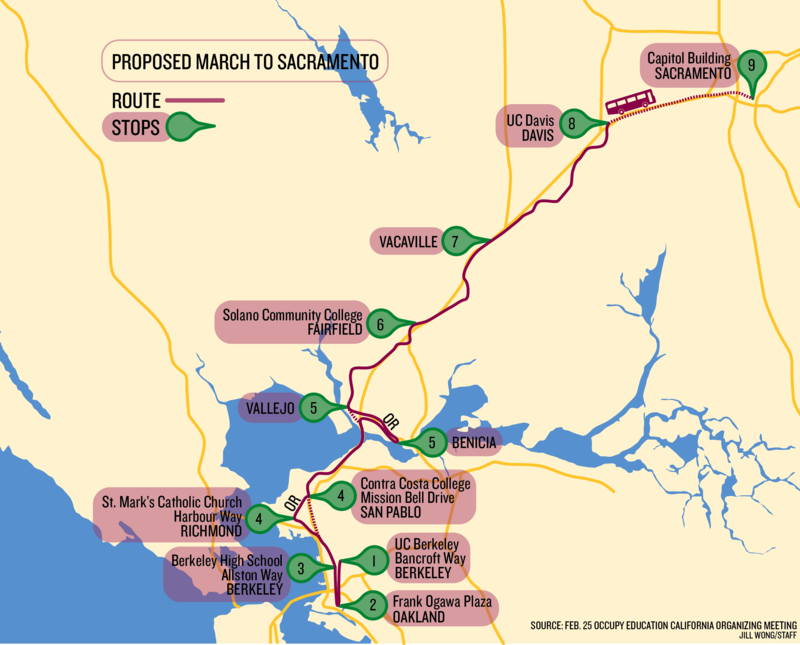 A long distance lays before about 30 protesters who are marching their way toward Sacramento as part of the “99 Mile March for Education and Social Justice” in support of public education. But despite the miles ahead, many protesters said they are optimistic about completing the journey. In preparation for the march, UC Santa Cruz freshman Iriany Lopez said it was difficult to get ready for what she knew was going to be a very long walk. Lopez said she has been walking more often to build endurance and hopes her background as a cross country runner in junior high school will help get her through the journey. The group departed from Berkeley around 5:45 p.m. Thursday, following a day of small demonstrations at UC Berkeley and a march through Oakland. The marchers are headed to the state Capitol, where a mass demonstration is scheduled for Monday. 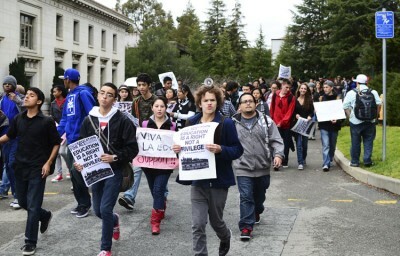 In a press release Tuesday, the UC Student Association estimated that over 10,000 students will attend the March 5 events in Sacramento. While most of the marchers are from the Bay Area, Argentinean native Capuccio Pablo — an English student at the San Mateo Adult School who is only visiting the United States for two months — decided to join the marchers as well. “My professor said that I (could) walk to Sacramento,” he said. “It seems that these cuts aren’t good for education. I am here to make society more aware about these issues,” he added in Spanish. For many marchers, neither the distance nor the scant living accommodations during the march seemed to be an issue. 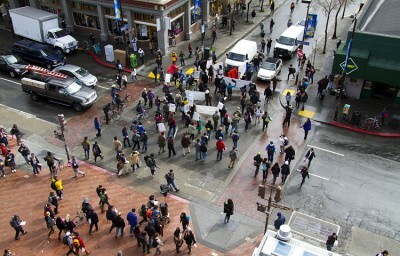 Since meals will be provided during the march – paid for by donations the marchers raised for food, gas, car rentals and other expenses – many protesters said they packed light. While some protesters said they started training to walk long distances as far back as January, UC Berkeley geography graduate student Eli Marienthal said he did not prepare ahead of time. Marchers were met with some enthusiastic responses Thursday evening from the honking horns of cars passing by, which were reciprocated with hoots and hollers from the protesters. 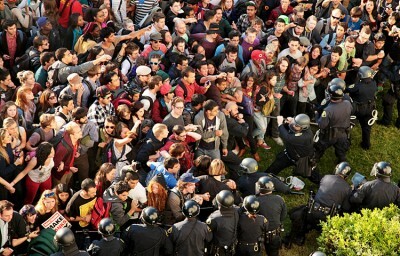 In Sacramento, police are gearing up for the convergence of protesters on Monday. “Our primary objective is to keep the peace so that people can say what they need to say and be safe while they are doing it,” said Sacramento police Sgt. Andrew Pettit. As of 9:45 p.m., the marchers were stopped at St. Mark’s Catholic Church in Richmond, where they planned to stay the night. The march is scheduled to pick up again Friday morning, when the protesters will be sent off around 9 a.m. by the mayor of Richmond to head to Vallejo. 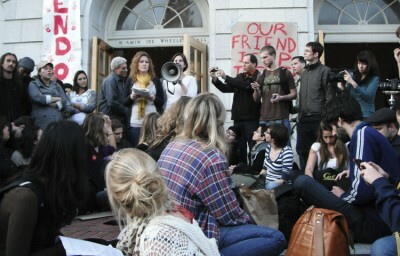 Staff writers Charlie Smith and Christopher Yee contributed to this report.